The Boys 8th grade Lakers finished eighth out of 10 teams in the regular season, and climbed their way into the tournament finals with three wins over the past two weekends. 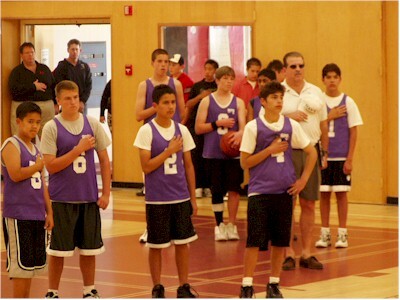 Each of the ten division final games began with a moment of silence for the Iraq war participants and the National Anthem. Scott's team stayed close all day to the 2nd place Bucks, but ended up on the short end of the final score, 44-47. We're very proud of these guys for making such a great run during the tournament.